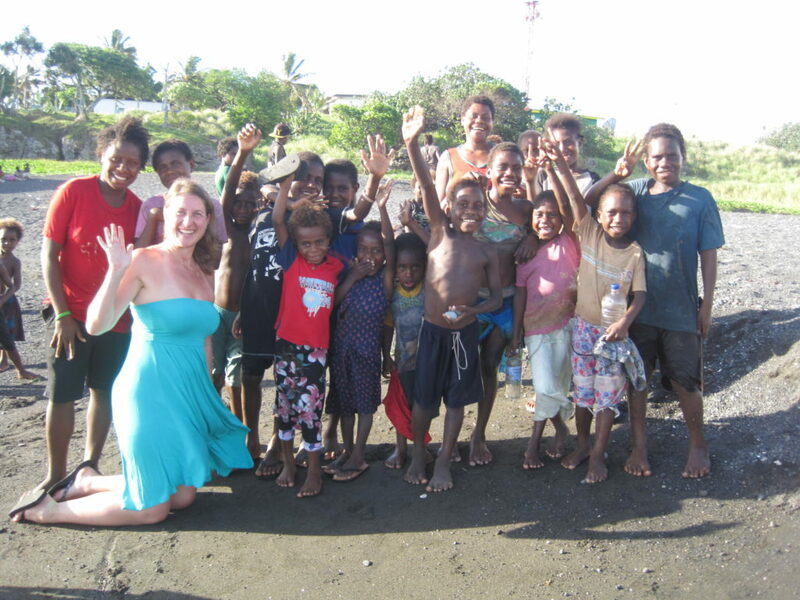 We came to Tanna for two reasons. 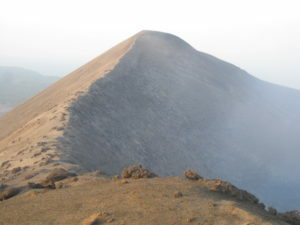 First was Mt. Yasar and the second was the John Frum Cargo Cult. 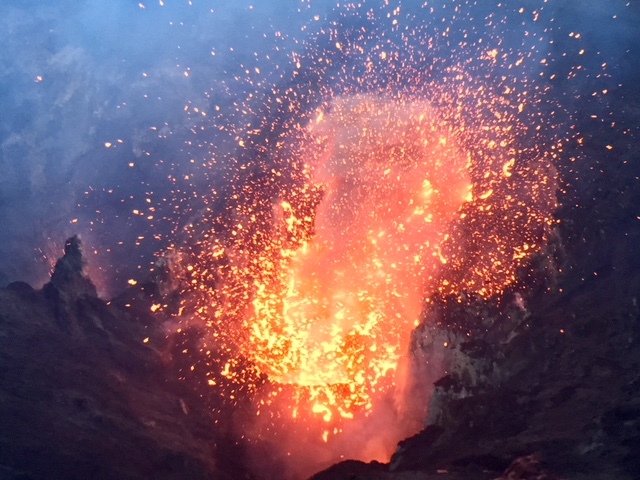 The volcano delivered hands down one of the coolest experiences ever. 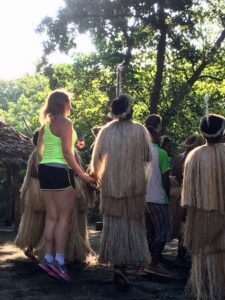 John Frum…didn’t happen for a few reasons, but onto the highlight! 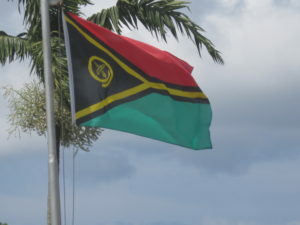 Vanuatu lies right on the top of the Pacific Ring of Fire on the western most edge. 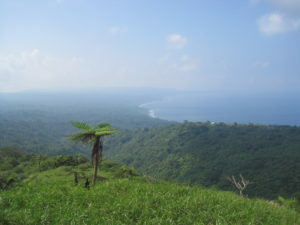 Being on the edge of the Pacific tectonic plate it is being forces up and over the Indo-Australian plate and this action causes frequent earthquakes and volcanic eruptions. 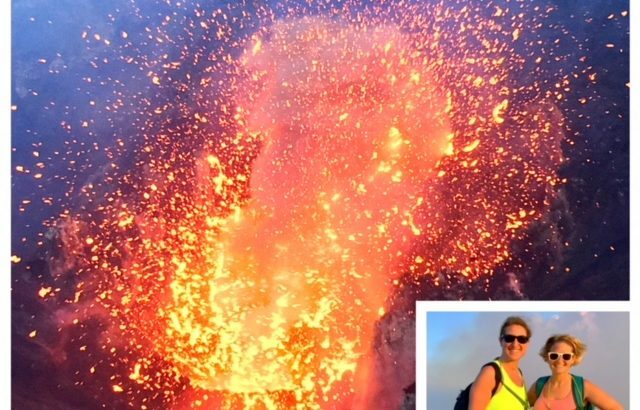 As I’m typing this, we saw on the news a neighboring island (Pappa New Guinea) had a massive volcanic eruption that forced over 600 people to evacuate. We knew this would be a whole day event as we left at 2pm and returned at almost 9pm. 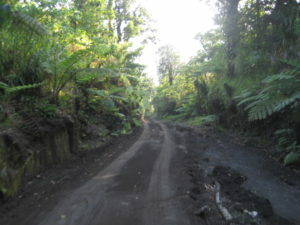 The drive was about 90 minutes each way as the “roads” were quite rough and most not paved. It was a bumpy and long journey…but so worth it! 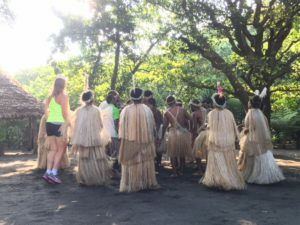 When we arrived at the volcano base, all visitors came to a welcome ceremony where they had us carry a country sign in to show the nations attending. There were about 15 different countries for the 45 attendees. 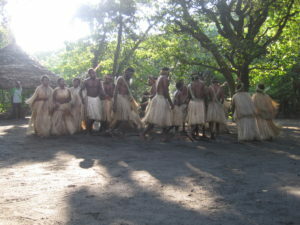 The local tribe came out to do a traditional Kava Root presentation, some singing, dancing from the tribe. Then they asked for guests to join for the second dance. No one got up to join…they asked again for guest to join so a Australian guy got up and said someone did…and then I got up and said I couldn’t let him be the only one and I thought more would join. Nope…just him and me. A local woman grabbed my hand and started jumping…and jumping and we jumped more. It was continuous jumping for almost a 4-5 minute song. I was tired afterwards! 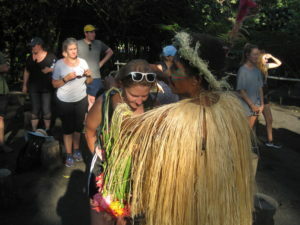 At the end, the tribe presented each guest with a flower lei to wear to the volcano. Women were jumping in the outer ring…it was a lot of continuous jumping! After the welcome ceremony, we were packed in the back bed of a 4 wheel drive truck for the 15 minute up the hill. 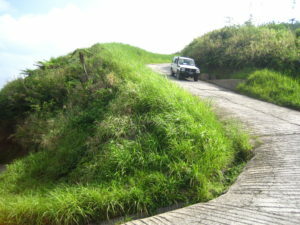 As the truck rocked back and forth climbing up the muddy hill, we were hanging and hoping not to be bounced out. 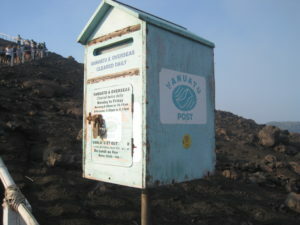 World’s only post box on an active volcano! 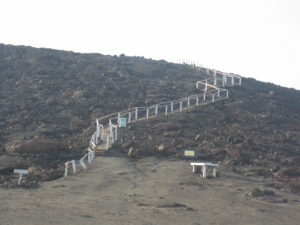 Only post box in the world on an active volcano and it’s collected by the post twice a day. 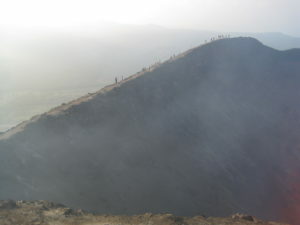 When we first got to the top of the crater, we heard the rumble of the volcano, and waited to see if it would blow. 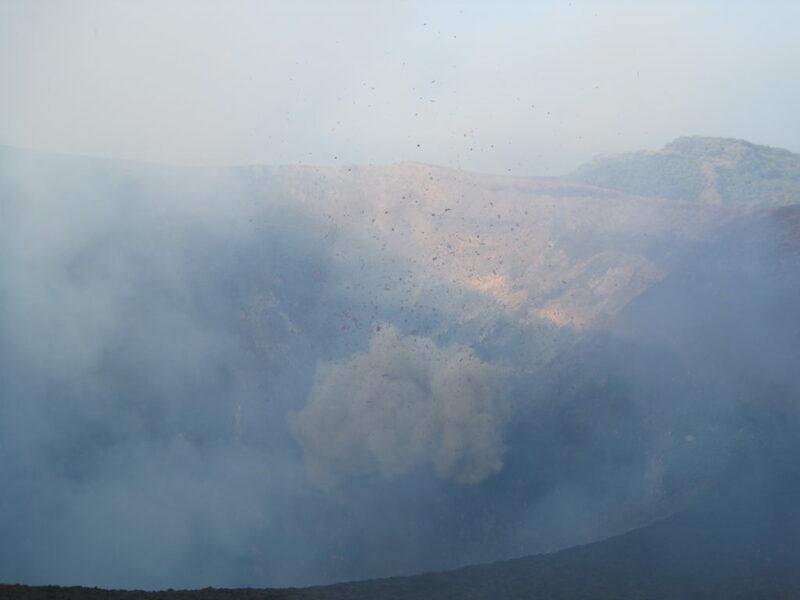 We heard it may blow every 15 minutes or so…but within a couple minutes, we had one of the largest eruptions and saw volcano chucks erupt higher than we were standing…it caught us all by surprise and you can see a few of these red chucks in the smoke of the photo below. This was about 5:00pm so still quite light out. 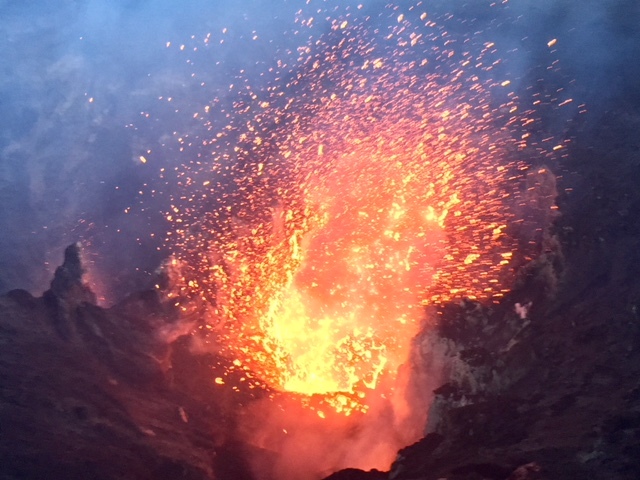 First eruption – and chucks that shoot way higher than us! 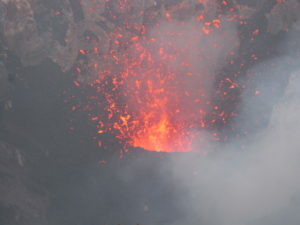 We started to walk west and it was very windy and volcano ash was blowing all over and the smell of sulfur was quite strong. If I had a bandana…I would have worn it around my face. Tip for next time! 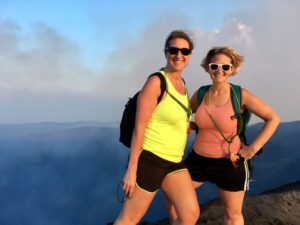 Instead, sunglasses on to protect eyes from ash flying into our eyes and off we walked. I had many friends tell me not to fall in and luckily we didn’t. I will laugh…some people were dumb and were trying to take selfies and got awfully close to going over. Milena and I decided we would ask someone to take our photo for more safety. 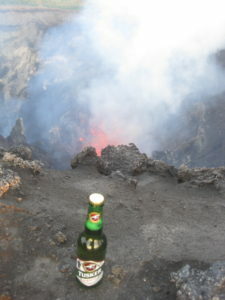 I brought a Tusker Beer up to the volcano and as I was taking a few photos…the volcano erupted and I got some volcano fire in the photo. 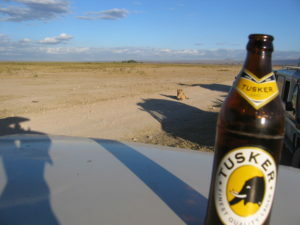 Vanuatu’s Tusker Beer at Mt. 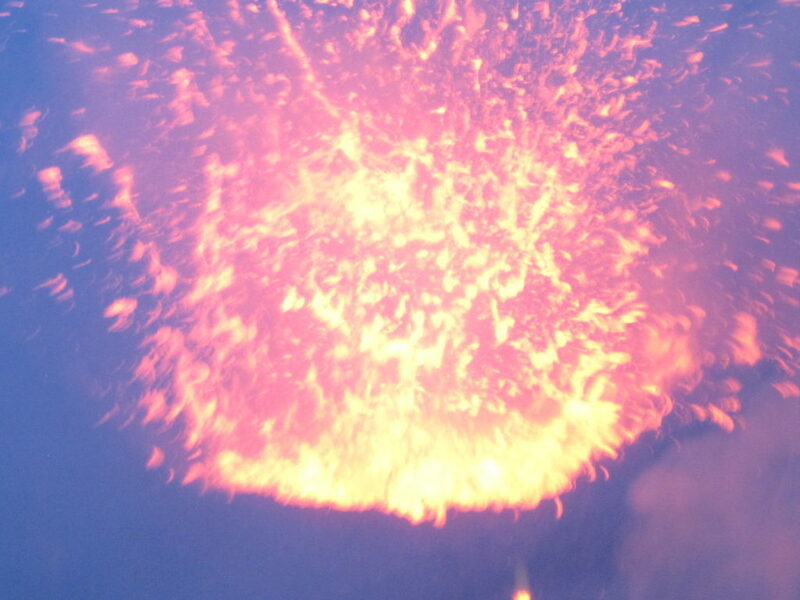 Yasar Volcano…caught it right when it started to erupt! 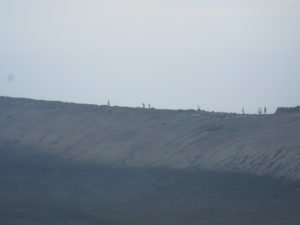 We walked a total of 1 mile from the last viewing point of the crater back to the trucks. 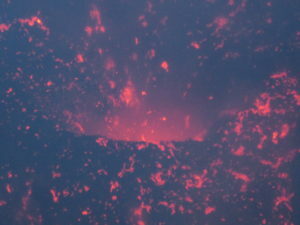 As it got darker, the colors became more vibrant and each eruption was more exciting. 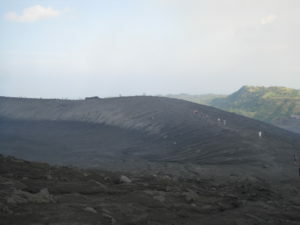 We started to leave the volcano around 7:00pm. 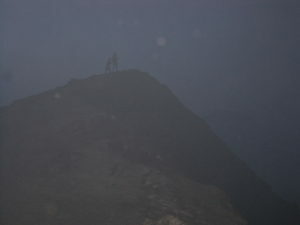 At this time, it was very dark out, smoky and I got this shot of the remaining people on the rim. I used my headlamp to walk back as it was dark, and you needed to wear sunglasses to protect your eyes…so a slow walk back making sure to see where you were going. 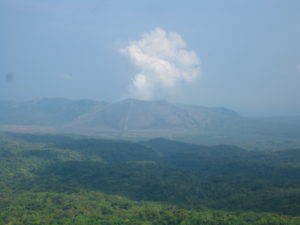 I didn’t want to end up like the movie “Joe vs the Volcano” as I wasn’t going to jump or fall into the volcano. 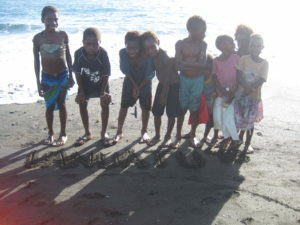 After such an amazing day with the volcano we had planned to do some more local things for our second day in Tanna. Once we got to the water, we had to navigate low tide to get out to the reef, and found a narrow crevice we could swim through. I quickly learned my mask was leaking but I could deal. 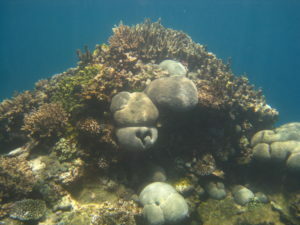 The reef was colorful and untouched which was nice. Milena and I heard there were turtles on the second (and further out). 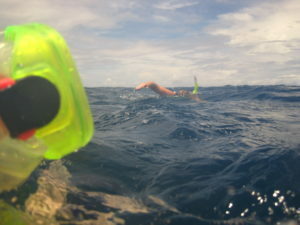 As we swum out to this reef and Milena saw the first turtle…my mask strap broke and we were done. I was brought back to swim team as I kicked in on my back against the current and it was a workout. We took a local bus, and by that, I mean a shared van that stops on the side of the road and picks you up. We met a local woman with a baby. We assumed it was her baby given age, but after talking to her more, we learned it was her brother. She was 22 years old, and her brother was 2 years old and she has 3 other brothers. She was surprised we weren’t married and didn’t have any kids as she said girls in Vanuatu are married by the age of 20 and have kids early. We saw her when we got on the bus, when we walked around town for a hour or so and then she was on the bus that we took back to our resort…so she was our local friend. 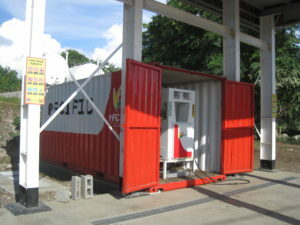 While walking around town, we came across the gas station, which had one pump in an old container. 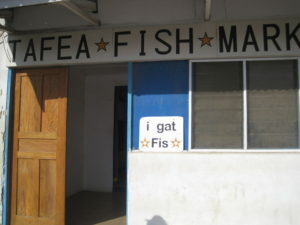 The fish market sign made me laugh “I gat fis” and the local stores were these little stores. 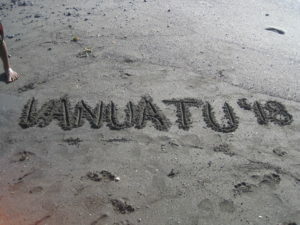 We came across a black sand beach and I wanted a memory and spelled out Vanuatu. This was the 3rd attempt as the tide was coming in so quickly, as soon as I finished the water washed it away two times. As this was taking me some time, the local kids were watching and trying to see what I was doing. When done, they wanted to be in a picture and all gathered for a photo with me. 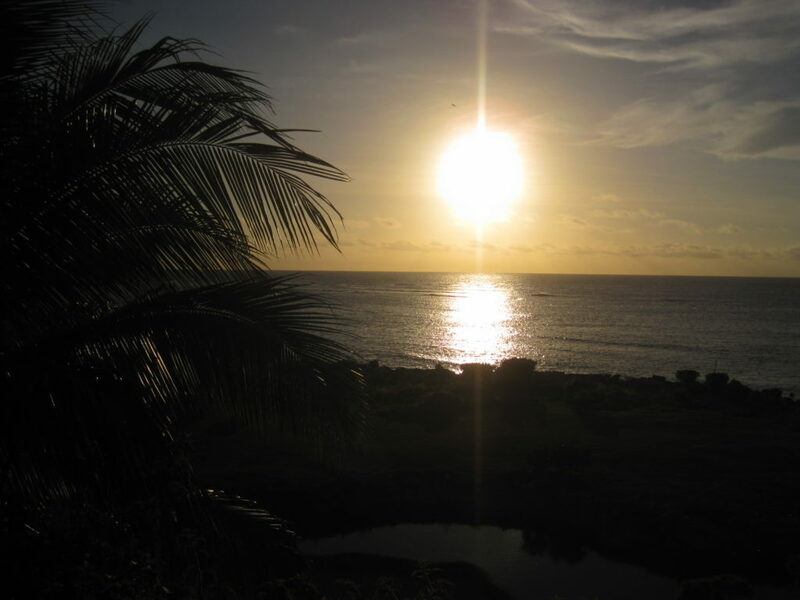 Tanna Evergreen Resort – nice place on the beach on the west side. 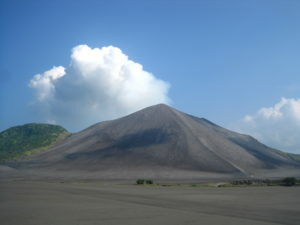 Further drive to volcano, but slower to town and airport. There were very few accommodations as most got destroyed a few years ago. 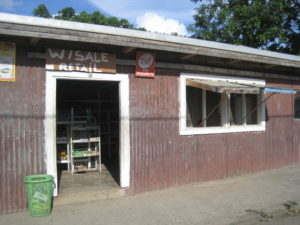 Many places are actively building so I’m sure it will be quite different in a few years. Fiji – Diving in Shark Invested Waters with Bull Sharks!